Snakes have proved that they are one of time's most successful and resilient survivors. They have been on the earth for well over 100 million years and have managed to persevere throughout the ages, while countless other species have disappeared around them. Today however, snakes are very much in peril. Hundreds of snake species are now in need of conservation if they are to survive. Currently, over 450 snake species are listed on the International Union for Conservation of Nature's (IUCN) Red List of Threatened Species. According to David Badger's book Lizards (Voyageur Press 2002), forty years ago herpetologist Archie Carr warned that "snakes are probably disappearing at a more rapidly rising rate than any other group of vertebrates," although he could offer little proof beyond personal observations. Now, however, ecologist Whit Gibbons and ten coauthors of a study in Bioscience have sounded similar concern, "the disappearances of the natural world are genuine... reptile declines are growing and serious in their own right." For many individuals the term endangered species conjures up images of exotic animals found in far away lands. However, the decline and endangerment of snakes can be seen around the world. In 2010 a global study of snake populations from the Centre for Ecology & Hydrology in England found that snake species were declining around the globe. The issues that plague snakes are not just exclusive to species found in the wild. Every year literally millions of snakes are unwillingly forced into captive settings. Here they are subjected to many forms of abuse and cruelty, while others are exploited like commodities for monetary gain. The most significant threat to wild snake populations today is the change in climate. According to Chris Mattison's The New Encyclopedia of Snakes (2007 Chris Mattison), concerns about habitat destruction, which were arguably uppermost in the thoughts of most conservationists in the 1980s and 1990s, have been supplemented, or eclipsed, with concerns over global climate change. Some scientists predict that up to one third of the earth's species may become extinct in the next century. Many of these will be snakes, lost as a result of desertification, rising sea levels, and increasing pressure on land that will be required to feed and house a burgeoning human population in a period of diminishing resources. Climate change is the suspected cause of the widespread disappearance of many snake species and the decline in their populations, even within intact natural habitat. One of the biggest issues affecting snakes is the loss of their natural habitat. Many areas that were once suitable for snakes to live have now been destroyed. Habitats of all kinds are being lost at an alarming rate. Wetlands are drained, forests are cut down, and waterfronts are developed. Snakes are literally losing their homes and they are losing them rapidly. Remaining natural habitats are often degraded and fragmented. Fragmentation occurs when healthy areas of habitat are isolated from one another. Snake populations are affected since gene flow between populations is prevented. Habitat fragmentation is also harmful because it often eliminates crucial requirements of the area which are critical to the survival of snake populations. Such areas include spaces that can be utilized for thermoregulation, prey capture, mating, and hibernation. Without such habitat requirements populations will dwindle. Habitat complexity is extremely important as it offers shelter to snakes from both predators and human persecution. Another important feature within snake habitats are gestation sites. These are areas where gravid females congregate to easily access shelter and places to aid thermoregulation. Snakes will often use the same sites year after year, so the loss of such areas in the form of habitat destruction can negatively affect the entire population and its reproductive output. Degradation occurs when the natural habitat has been altered and degraded to such a degree that it is unlikely that any remaining snake species would be able to survive. Contaminants and sewage run off from developmental construction and human settlement further causes harm to snakes and their increasingly degraded habitats. Pesticides, oils, chemicals, and industrial pollution contaminate the habitats of snakes and their local prey. When the snakes consume contaminated prey, they may become poisoned and die. Habitat destruction and degradation can also effect the availability of prey items, causing unnatural declines in appropriate food sources. Snake habitats are also often subjected to human-induced alterations. The introduction of erosion netting or similar netting materials such as nylon netting, plastic bird netting, chicken wire, glue traps, and garden traps can all pose serious risks to snakes. These reptiles often end up trapped, seriously injured or even killed as a result of being entangled inside such materials. Similar incidences can arise when snakes become trapped in twine, discarded netting and fishing lines. Habitat loss presents a huge problem for snakes that experience cold weather conditions. When temperatures become too low for snakes to remain active, they retreat to dens known as hibernacula. These dens go well below the frost line and provide a winter sanctuary for the snakes. Large congregations of snakes, sometimes of varying species, use the same dens year after year. When dens are destroyed through construction and developments, the snakes are left without a winter refuge and perish. Habitat loss puts snakes in greater danger of encounters with humans. Once their natural habitat has been destroyed, snakes are forced (by no fault of their own) into urbanized environments. Here they are likely to be killed by fearful humans, or those who deem them as pests. Habitats are often isolated and cut off from one another by the roads and highways that now run through them. Countless numbers of snakes are killed on roads and highways every year when they are hit by vehicles. In many cases, people will purposely swerve to run over and kill snakes. Snakes are attracted to roads because the sun baked surface provides an opportunity to absorb heat. Roads present an additional problem for snakes because they represent a form of habitat loss. The roads that run through natural areas also fragment the existing populations, drastically making them smaller in size. This limits the gene flow and genetic diversity between the isolated populations on either side and this greatly increases the chances of extirpation. When snakes must cross roads to travel between the populations, it greatly increases their chances of being hit and killed by vehicles. While human activities have negative effects on snakes, they have helped increase a number of snake predators. The increase in human waste has provided an unlimited food source for predators like skunks and raccoons. This has caused the number of these predators to increase significantly, and this surplus of predators takes its toll on snake populations. Every year literally millions of snakes are harvested directly from the wild so they can be used, abused, and exploited for fiscal accumulation. Snakes are captured for the pet trade, for their skins, and for food. Snakes are also captured and then ruthlessly killed so that they can be dried and mounted. These deceased snakes are then sold as decorative ornaments. Numerous other snakes are relentlessly killed so parts of their bodies can be utilized and then sold off. Rattlesnake heads and rattles are used to make keychains. Rattlesnakes are also killed and made into paper weights, belt buckles and numerous other trinkets. The fangs from snakes are sometimes used to make earrings. The list of products that contain parts of snakes is seemingly endless. It is a stark reminder of the immense desecration and malice that these animals continually receive. According to People For The Ethical Treatment of Animals (PETA) spokesperson Ashley Fruno, each year around the world, millions of crocodiles, lizards and snakes are subjected to abuse and killed for their skins. National Geographic reports that more then 24 million reptile parts were exported from Southeast Asia alone between 2000 and 2007. Reptile skins are used for handbags, purses, belts, shoes, boots, wristbands, clothes, and more. According to PETA, every year, millions of snakes are impaled on hooks or nailed to trees by their heads and skinned alive. Large snakes like pythons have hoses inserted into their mouths and are pumped full of water to loosen their skin so that it will cut away more easily. The animals' peeled, writhing bodies are then discarded, and it can take days before the animals die from the effects of shock and dehydration. According to Ingrid Newkirk's Making Kind Choices (St Martin's Press 2005) some of the skinned snakes are still alive for two or even three days later. According to Dr. Clifford Warwick, a specialist in reptile biology and welfare, almost all snakes used for the skin trade are wild-caught. He went on to say that "Snakes are never killed in a good way. They are decapitated and eviscerated. I'm quite sure that the use of snakeskin by fashion houses is threatening the sustainability, the durability, and the sheer number and safety of snakes in the wild." Large numbers of snakes are killed for food every year. Restaurants offering various snake dishes are popular throughout Asia. Snakes are also killed for alcoholic beverages. According to David Allen (2001), the body of a snake or several snakes is left to steep in a jar or container of liquor. It is claimed that this makes the liquor stronger (as well as more expensive). One example of this is the Habu snake, which is sometimes placed in the Okinawan liquor. This is known as "Habu Sake." The consumption of snakes is not restricted to Asian countries alone. Rattlesnake meat is widely consumed and sold across the Midwestern United States. Many traditional Chinese medicines involve the use of snake meat, organs, or blood. These practices represent yet another realm in which snakes are violated, killed, and used by humans. The fats and oils from snakes, typically the Chinese Water Snake (Enhydris chinensis) and certain species of rattlesnakes (Crotalus species), are used in Chinese and traditional medicines to treat joint pain. Aside from being harvested and kidnapped directly from the wild, many snakes are also bred in captive settings to help satisfy the demand for their use as food and for their skins. These snakes are simply produced and then murdered so they can be used by profiteers. Snakes are often used as "props" or gimmicks in movies and television shows. Here they may be subjected to any form of misuse and agony. The portrayal of snakes in the media is detrimental to these animals. Snakes are often portrayed as aggressive and malicious creatures. This reputation only promotes a fear of these animals and this fear helps fuel unjust and widespread persecution. Snake charmers and "side show'' handlers also exploit snakes for monetary gain. The snakes that are used in such acts are often kidnapped from their natural habitats. Many snake charmers and snake handlers do not give their animals the proper care they need to remain healthy. In fact most handlers subject their snakes to terribly cruel and inhumane conditions and inflict horrendous acts of abuse upon them. Such abuse includes having the snake's venom ducts punctured with hot needles. This incapacitates the animal's ability to deliver venom. The handlers will also pull out the snake's fangs or sew their mouths shut as a way of avoiding bites. These actions cause the snakes extreme pain and suffering. It also leads to premature death. This means new snakes will have to be obtained for use in the side-shows and these replacement snakes will be subjected to the same agonizing cruelty. Various species of vipers are kept at the snake temple in Bayan Lepas, Penang, Malaysia. The site is a popular tourist attraction. The snakes that are held in the temple have all been crudely altered to incapacitate there ability to inject venom, a very cruel practice. The most abusive aspect of this brutality is that it as been inflicted upon the snakes purely so they can be degraded and used as a tasteless tourist attraction. Snakes are undoubtedly fascinating. This interest has inspired many individuals to seek out snakes in the wild. To satisfy this demand, eco-tours have sprung up. These tours offer to take thrill seekers out into natural habitats for a chance to encounter wild snakes up close. Such activities are harmful for several reasons. Vigorous recreational usage of sensitive natural areas can destroy and degrade snake habitats. Sometimes micro-habitats will be intentionally destroyed in an aid to find snakes (ripping apart rock piles, rock outcrops, turning up leaf litter, destroying hollowed logs, etc). Harsh and damaging chemicals worn by the tourist, such as insect repellents, cause harmful effects to both snakes and their prey. An example of this can be seen in the case of eco-tourists who seek out anacondas in the Amazon. The Telegraph newspaper reports that the high-strength insect repellant that tourists use to protect themselves from mosquitos is absolutely fatal to the anacondas. The insect repellant, along with some types of sun cream, is extremely toxic. It is getting washed into the pampas and left in the swamps where tourists are hunting for the snakes. "We are finding between 25 and 30 dead anacondas per year which have been poisoned. It is terrible." Any trace of foreign contaminants can be quite deadly to this region. According to Extreme Adventure News.com, Bolivia's eco-tourism industry has exploded over the past decade. Those traveling to and through the Amazon basin use to number in the low hundreds. They now top out at over 12,000 visitors a year. Much of this increase is do to eco-tourism marketing which has placed priorities on showing off some of the spectacular and varied species in the area. Most are intrigued by the opportunity to have a chance encounter with the world's largest snake. People who strive to encounter snakes in the wild are not always participants of eco-tours. Many individuals will venture out during the summer months in search of snakes. These people (known as herpers, derived from the word herpetofauna) can cause many of the same harmful effects as eco-tourists. 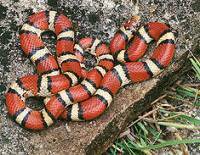 Herpers will often ransack habitats to find snakes, and will often disturb their natural basking and forging behaviors. Others will carelessly handle snakes or capture them. An appreciation of wildlife is a wonderful attribute to have. However, individuals who wish to enjoy snakes in the wild should do so by observation only. Care should always be taken to be as respectful as possible in natural areas, and this means experiencing them without wearing harmful chemicals. Wild snakes should also never be captured or handled, the only exception being when moving snakes off of roads in the direction they were headed or moving them away from other dangerous situations. Similarly to sea turtles, sea snakes fall victim to being trapped inside nets, trawls, and lines that are intended to catch other prey. Estimates from the Northern Prawn Fishery indicate that in 1991 alone between 30,000 and 67,000 sea snakes were killed as a result of commercial prawn trawling. However, this estimate contains figures from just one fishery, globally the number of sea snakes that are killed as a result of incidental catch would be significantly higher. According to the Great Barrier Reef Marine Park Authority female sea snakes are caught more often than males, and that mature snakes are caught more often than juveniles. This is especially disturbing as mature females are crucial to the reproductive output of the population. The loss of mature breeding capable individuals can have devastating effects on the entire population. The introduction of non-native plant and animal species can have very serious and negative effects on eco-systems and the native fauna that reside in them. These effects include the decline of snake species. According to Partners in Amphibian and Reptile Conservation (PARC), invasive species pose a constant threat to native herps (reptiles and amphibians). Invasive plants and animals can alter the ecological community that is relied upon by native reptiles and amphibians. Invasive herpetofauna can also directly damage native populations. For example, in many parts of the U.S., invading bullfrogs are preying on and often eliminating other amphibians, as well as impacting some reptiles and fish. Snakes are often the victims of malicious and deliberate killings by fearful people. According to Seburn and Seburn (2000) snakes are feared and persecuted by humans more than any other group of animals and humans are the greatest threat to most species of snakes. Many snake species live in areas where they will become inactive (hibernate) for many parts of the year. Due to this inactivity, and the relatively short time to feed and reach an adequate and healthy weight, breeding females may only produce young once every two or three years. In some areas as much as two-thirds of the breeding population will not reproduce young. This means that the direct killing of any gravid females can have serious effects on the decline of the entire population. This makes the persecution of snakes from humans a very serious threat. An example of the immensely destructive effects that direct persecution can have on snake populations can be clearly seen in the case of the Timber Rattlesnake (Crotalus horridus), which once occurred in Southern Ontario. Timber Rattlesnakes use to be found in the Niagara gorge area of the province, however deliberate killings of the snakes, often in the form of bounty hunting, commercial collecting and sport hunting at communal overwintering dens quickly exterminated the entire population. The last sighting of a Timber Rattlesnake in Ontario was in 1941. The snake is now listed as extirpated (a species that is extinct or completely exterminated in one area, but occurring elsewhere in the world) from Canada. The most extreme example of people directly killing snakes are the annual rattlesnake roundups that are held across the United States. The snakes used in these roundups are captured from their natural habitat. In many cases, gasoline is poured into dens to force out the snakes. During the roundups the snakes are subjected to brutal torture, including being kicked, stomped on, whipped, burned, and skinned. Snakes are then callously killed by decapitation. False information on snakebites are given out at roundups to inspire fear and the justification of the barbaric animal cruelty and disregard of life that is carried out. Roundups account for the deaths of over 100,000 snakes annually across the United States. A massive number of snakes are being lost each year through the combination of the many threats mentioned above. This unnatural decline in snake populations cannot rebound on its own. This is why the conservation of many snake species is required. Without assistance, many species simply cannot continue to survive the many hazards we have created for them. Furthermore, literally millions of other snakes are being forced into captivity where they are being subjected to horrific acts of abuse. The threats that snakes face are being inflicted by rapacious humans who have monopolized and plundered the earth, causing habitats to become destroyed and degraded. These maraudering individuals brutalize, assault, and murder snakes for the most trivial and covetous of reasons. The most common of which is financial gain. Many individuals have a thought process that views human beings as the most intelligent, superior, and enlightened lifeforms on the planet. If people are to have such views of themselves then they must use such intelligence and perception to realize that the majority of treatment that snakes receive from humans is nothing short of barbaric and deplorable. Humans must use their privileged position to strive to live in such a manner that is not detrimental or cruel to the other species on the earth; many of which species (including snakes) have been here for millions of years before humans appeared. This gives snake species every right (if not more then humans do) to live on this planet. It also gives them the right to live free of cruelty, persecution, and from infringements on their freedom.